The sound of water falling down the hills, the wind rushing past you, blowing up your hair. The feeling of freedom, of new possibilities and the promise of unforgettable memories. That is the magnificence of traveling to new places. So let me take you through one of the trips from my travel diaries. To all the adventure lovers, seeking thrills, add Rishikesh to your bucket list. This quaint town with lush green forests, located in the foothills of the Himalayas in northern India, is known as the ‘Gateway to the Garhwal Himalayas’ and ‘Yoga Capital of the World’. It is located in the Indian state of Uttarakhand. This place has something for everyone; whether it is spirituality, serenity, yoga or adventure sports. 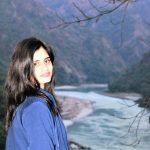 The magnificent Ganga flows through the city and is breathtaking in its might and major tourist spots like the cities of Haridwar, Mussorie and Dehradun are close by. Rishikesh is fast becoming a hub for adventure sports activities such as rafting, camping, trekking and bungee jumping. 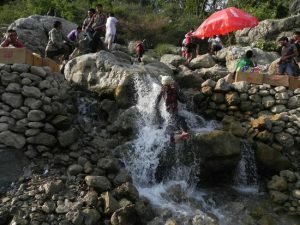 It is also known as the white water rafting capital of India. This has been attracting tourists from all over India and abroad. I too went river rafting there, and guess what? It was in the freezing month of December. What can I say? It is an opportunity one should never miss despite the weather. 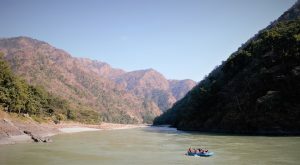 But the best time to visit Rishikesh for River Rafting is from late September – October to mid-November, and then from early March – April to first week of May. To be more specific, River rafting is done from Shivpuri, about 19 kilometers from Rishikesh. So let me give you a short to do list on how to go about it. Firstly, start early and reach the areas from where rafting is done. There are various spots with different shops who provide you with complete rafting packages. 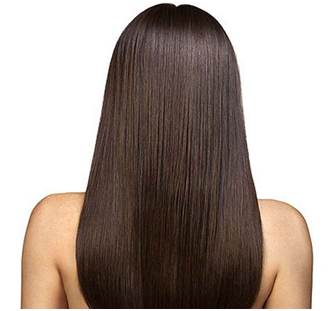 Make sure the package you select actually includes all the activities that you are looking to participate in. For an adventurous person there are several adventure packages that includes activities like bungee jumping, body surfing, cliff diving, camping, mountain biking, rock climbing and rappelling. 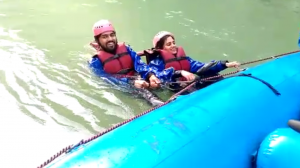 Others offer many 1 night 2 days packages in Rishikesh that includes activities like rafting, camping, cliff diving, body surfing, meditation and temple tour. 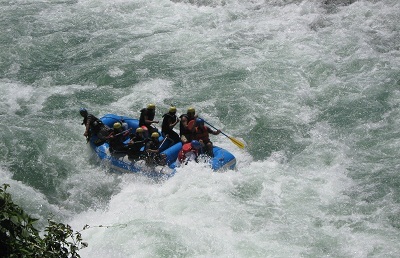 There are also river rafting packages for families, corporates as well as for students. Scout the area and select the shop which offers you the best deal (many rafting shops are present). Based on different levels and distance covered, there are 4 main starting points- Brahmpuri, Shivpuri, Marine Drive and Kaudiyala. Choose anyone according to your wishes. Now once all this is done, the people in-charge of your experience take care of everything else. You are loaded into a SUV and driven to the point where your rafting journey will start. On reaching you are decked in the life jacket and helmet and given your oar. The instructor will instruct you and then you are ready to go!!! So it was at noon on the 27th of December that I had a rendezvous with the Ganges. Now let me start by saying this activity is not for the faint hearted. You should accept and be ready for the fact that you might end up in the freezing water. Ganga is wild!!! You never know what her mood is like. And if somehow she is angry, you might have to take the brunt. Keeping this in mind our little group of 4(minimum number needed) along with our instructor started off. In the beginning the instructor guided us on the basics of how to paddle, sit and not end up face first in the river. After this we took off on a three hour journey. Some of the popular rapids that we tackled in this stretch include Black Money, Cross Fire, Three Blind Mice, Return to Sender, Roller Coaster, Golf Course, Club House, Double Trouble, Hilton and Terminator. I know, some interesting names right? After tackling a few rapids, when we reached a relatively calmer patch, our instructor asked us to jump! It is part of the experience he said. Being a water baby I never miss out on an opportunity to take a dip. So even though it was super cold, I jumped right in. As the journey continued, the instructor took us to a maggi point where all the rafts are docked and we get a mini break. My brother and I ended up eating maggi while my dad had tea and chips. If interested, their is a option for rock jumping too. After this, it is the last phase and we reached the end successfully, which I think equates without having our raft upturned. At the end of it we were again loaded in the vehicle and taken back to the drop point. The entire experience is one that I will never ever forget. It was fun, exhilarating and intoxicating. It made me laugh even when I was freezing and made me feel alive. Isn’t that what we are looking for? When most things in our lives become a routine and mundane and there is nothing new, an experience like this can add a little something to it. I think that is the reason people seek adventures. I now understand the term adventure junkie. These activities, that let us test our limits, face our fears and have fun along the way our worth it. It doesn’t harm that there are plenty of photo opportunities and you can boast about it to your friends. Just do it with caution and never lose your head. Also, follow the instructor!!! Next PostBe careful in choosing DIAPERS…. !